Such world-scale catastrophes as the Ukrainian Holodomor of 1932-33 will never be perceived by society as a theoretical academic issue, a problem of purely scholarly importance. The tragedy of the terror by famine is above all our persistent and enduring pain. But because this terrible catastrophe has been used, whether we like it or not, as an exceptionally devastating weapon in the contemporary political struggle, it is our historians’ moral duty to study the causes and as yet unknown consequences of this Apocalypse, constantly search for new evidence and proof of its genocidal character, and investigate its impact on the consciousness of various generations, in particular contemporary youth. This is what Dr. Stanislav KULCHYTSKY, one of Ukraine’s leading authorities on the history of Soviet totalitarian society in the 1920s-1930s and a regular contributor to The Day, discusses in his latest article. The famine caused by grain procurement campaigns spiked in June 1932, when for the first time the death rate in Ukrainian rural areas exceeded the birth rate. In October 1932 the mortality rate again began to exceed the mortality rate, this time owing not so much to draconian campaigns as to the selective but large-scale imposition of fines in kind (paid in potatoes, meat, and pork fat) on so-called debtors — if no grain was found during searches. After they received Stalin’s telegram, Cheka officers, with the help of starving poor peasants, conducted a one-time food expropriation campaign disguised as a food procurement operation. As a result, the death toll rose from 35,000 people in December 1932 and 44,000 in January 1933 to 136,000 in March, 174,000 in April, 253,000 in May, and 361,000 in June 1933. Two circumstances should be considered: first, these figures reflect both natural and unnatural deaths, and second, demographic statistics for 1933 represented no more than half of all deaths; at the same time the undercount was progressively rising as a result of the disruption of life caused by the famine. Each of the above statements has documentary confirmation; together they will make up a large monograph. It is quite likely that some of the statements in my forthcoming book will be subjected to a future review. However, my own experience, in particular with my previous manuscript on the Holodomor (1991) indicates that during a review conclusions based on facts tend to be deepened and elaborated rather than replaced. Post-Soviet Ukrainian historiography has yet to produce a single book devoted specifically to collectivization, because scholars in this area rushed to study the Holodomor. However, the famine in rural areas of the USSR was the product and consequence of collectivization. I had to rely on the results published by Western scholars, who obtained access to the Kremlin archives in the last two decades. For example, Lynne Viola in her book Peasant Rebels under Stalin (1996) offers a sound treatment of the spring 1930 crisis in the USSR. The researcher argues that Stalin wrote his famous article “Dizzy with Success,” which renounced forced collectivization, under the obvious impact of events taking place in the border regions of Right-Bank Ukraine. In the prewar period Ukraine was the focal point of mass repressive measures. In the postwar period they continued unabated in the western oblasts until they eventually ended after Stalin’s death. This was immediately reflected in the condition of the Soviet social system, which came into being through violent methods. For the sake of self-preservation, Stalin’s successors were forced to devote special attention to increasing the material and cultural standards of living in Soviet society. Never before pampered by the state, the people gave the party its due for taking care of their well-being. (I am using this typically Soviet expression without a hint of irony.) The country got its second wind and for a long time was able to match Americans in the missile and nuclear arms race, as well as in space exploration. However, the Soviet economy was ineffective by definition. It was incapable of meeting the colossal liabilities of a superpower and the growing demands of the population. For a while the country remained afloat thanks to its oil dollars and gold-mining industry. But the need for urgent and radical reforms in the political and economic spheres gradually began to crystallize. Mikhail Gorbachev launched the perestroika policy with optimism that eventually yielded to the realization that the Soviet system could not be reformed. As soon as the force field of the Kremlin dictatorship disappeared, the USSR began falling apart along the borders between its constituent republics. In this situation the problem of the 1932-33 famine came to the forefront. The Ukrainian famine was common knowledge, but public references to this murky page of the past were prohibited. This ban lasted for decades because the famine was inseparable from collectivization. In his landmark speech of November 1987, Gorbachev again called collectivization a great achievement of the Soviet Communist Party. However, less than a month and a half later Volodymyr Shcherbytsky was compelled to acknowledge the famine in his speech dedicated to the anniversary of the Ukrainian Soviet Republic. He was forced into making this acknowledgment by the productive activity of the U.S. Commission on the Ukraine Famine of 1932-33. Stalin’s Cheka officers physically destroyed the generation that participated in the Ukrainian revolution. Stalin’s propagandists raised the subsequent generation in the spirit of communism. The spiritual connection between generations was severed. Nonetheless, during Gorbachev’s reforms information about the Holodomor and other crimes committed by Stalin’s regime brought about truly revolutionary changes in the consciousness of people who were products of the Soviet system. They learned the lessons of the national liberation struggle under the banners of the Ukrainian National Republic (UNR) and brought them to the attention of the masses. As a result, the UNR’s state symbols were adopted by Ukraine’s Soviet Communist Party cadre in an effort to turn the republic into a real state and depart to a safe distance from Moscow. In subsequent years the government’s nomenclature-based party avoided mentioning the dark pages of the Soviet past. It was only on the 65th anniversary of the Holodomor that President Kuchma, by his decree of Nov. 26, 1988 and under pressure from Rukh MPs and the American diaspora, instituted the inaugural day to commemorate the Holodomor victims on the fourth Saturday of November. As the next anniversary was approaching, the government’s attitude to the Holodomor underwent a radical change. On March 20, 2002, Kuchma issued the edict “On Measures in Connection with the 70th Anniversary of the Holodomor in Ukraine.” The decree reflected recommendations from scholarly, non-government, and political organizations, which were aimed at drawing citizens’ attention to this tragic event. On Nov. 21, for the first time in its history, the Verkhovna Rada recognized the fact of the Holodomor: with 299 votes it passed a resolution to hold parliamentary hearings in memory of the Holodomor victims. On Nov. 28 another landmark event took place: in its decree on the 70th anniversary of the Holodomor the Verkhovna Rada joined the president’s demand to initiate a campaign for international recognition of the Holodomor as an act of genocide against the Ukrainian people. A report by Vice-Prime Minister Dmytro Tabachnyk was also included in the agenda. Guided by the definition of genocide in the UN General Assembly’s resolution of Dec. 11, 1946, and the UN Convention on the Prevention and Punishment of the Crime of Genocide of Dec. 9, 1948, Tabachnyk declared that all the hallmarks of this crime are contained in documents pertaining to the Holodomor of 1932-33. These words provided ample grounds for appealing to the international community. But not everyone considered the question of legal qualification important. There were not enough MPs at the special meeting to put the motion to a vote. The next day, however, Lytvyn managed to garner the 226 votes needed for a positive vote. In response to Ukraine’s request, in November 2003 the UN General Assembly adopted a joint statement on the 70th anniversary of the Great Famine of 1932-33. The statement was signed by 36 UN members, including the Russian Federation. This document, recognizing the Holodomor as a national tragedy of the Ukrainian people, was midway between victory and loss for Ukraine. The reason is that Ukraine’s Ministry of Foreign Affairs had to delete the definition of the Holodomor as genocide in order to push through the vote. Because of Russia’s intractable stance the document’s level was lowered from a UN resolution to a joint statement. On the other hand, by signing the statement Russia for the first time acknowledged the fact of the Holodomor, i.e., the enormous scope and disastrous consequences of the all-Union famine for the Ukrainian people. The third president of Ukraine put historical issues on the front burner. Viktor Yushchenko believes that national unity is impossible without a deep understanding of our past. Therefore, the government is working to establish the Ukrainian Institute of National Memory. In order to be able to request a 2008 UN resolution recognizing the Holodomor as genocide, we had to have the Ukrainian parliament pass a corresponding law. Exercising his constitutional right, the president submitted the bill “On the Holodomor of 1932-33 in Ukraine” and rated it as urgent. Quite unexpectedly, the Verkhovna Rada found itself in the world’s media spotlight. 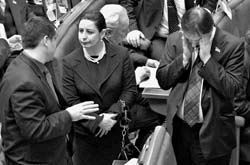 The political confrontation in parliament ended in a defeat of the so-called anti-crisis coalition. On Nov. 28, 2006, parliament passed the law on the Holodomor as genocide by 233 votes, including 118 from the Yulia Tymoshenko Bloc, 79 from Our Ukraine, 30 from the Socialist Party, 4 from independent MPs, and 2 from the Party of Regions (Anna Herman and Taras Chornovil). Experts at The Day ranked the adoption of this law as one of the most important events of 2006. This is undeniable. I could not rid myself of a feeling of great humiliation when I saw the phrase “Holodomor - the Forgiven Holocaust” on English-language Internet sites. Now that feeling is gone. Our politicians and historians should be getting ready to submit a request to the UN General Assembly, asking it to determine that the Holodomor of 1932-33 in Ukraine meets the criteria of the UN Convention on the Prevention and Punishment of the Crime of Genocide. Historians are ready; what about politicians? I heard through the grapevine (I was not contacted directly) about the creation of a group of specialists who will be tasked with finding documentary proof that the Holodomor of 1932-33 does not meet the criteria of the UN Convention. If they publish their results, it is likely that our politicians’ next step will be to demand that parliament reconsider the law on the Holodomor. This is deja vu! In 1986 I was asked to join a commission at the Ukrainian Communist Party’s Central Committee, which was supposed to prove that the famine of 1933 was a figment of Ukrainian nationalists’ imaginations. The Central Committee members in charge of this commission sincerely believed they were setting a feasible task. Slipchenko gave this interview several days before parliament passed the law on the Holodomor. He probably had more optimism after the event. But even today we should not view this problem from an excessively optimistic perspective. First of all, Russia’s position has great weight-and it will definitely be negative. Perhaps we will manage to convince Russian scholars first, then Russian society at large, and finally their political circles that the Holodomor in Ukraine was different from the famine of 1932-33 in Russia. Serious politicians will not be willing to conceal Stalin’s crime if its mechanism becomes known to the international community. Meanwhile, exactly how does this community treat the issue of the Holodomor? Western historiography of the Holodomor is expanding. Scholars from different countries are engaged in debates, trying to establish the nature of its unique phenomenon, which is very different from that of the Holocaust. Ukrainian historians do not have unanimous support in the West. I will dwell on the evolution in the positions of two authoritative Western specialists on Soviet history. The first Western researcher of the famine of 1932-33 is the English historian Robert Conquest, who has spent a considerable part of his life teaching in American universities. His finest work is The Great Terror, a book about the mass repressions of 1937-38 in the Soviet Union. Soon after it was published, it appeared in translation all over the world. A Russian translation was published in Florence in 1974. Since then the book’s title has served as the name of this horrible tragedy that befell the Soviet people. Because this book earned Conquest world acclaim, the Ukrainian diaspora in North America asked him to write about the man-made famine in Soviet Ukraine. He agreed and spent nearly five years writing a book. The English, Russian, and Ukrainian editions of this book appeared nearly concurrently in London in 1986. The author titled his book The Harvest of Sorrow: Soviet Collectivization and the Terror-Famine. Conquest found a precise definition for the phenomenon at the center of his book- terror by famine. This designation also became standard in scholarly usage. Even two or three decades after their publication, Conquest’s books still have an impact on the assessment of postwar events in the Soviet Union. However, his own assessments are being perceived with increasing skepticism. Many Western scholars point to the fact that Conquest’s thesis about the genocide by famine relies on testimonies of anticommunist-minded eyewitnesses and is therefore devoid of scholarly objectivity. Conquest’s opponents strive to avoid politicizing historical research. They consider themselves revisionists in the field of Soviet studies, but the vector of their revision is the opposite of ours. Whereas we are overcoming the myths engendered by communist propaganda, they seek to dispel anticommunist myths. Unfortunately, the discrepancy between the real history of the Soviet period and its earlier conceptualizations is causing misunderstandings among historians. The position of Robert Davies, a professor at the University of Birmingham, demonstrates this most vividly. A student of Edward Carr, Davies is justly considered a world authority on Soviet socioeconomic history. On the basis of published sources, Carr wrote the 14-volume History of Soviet Russia covering events until 1928. He refused to continue this work because after 1929 published Soviet sources misrepresented the reality. Davies obtained access to Soviet archives and picked up where Carr had left off. The fifth volume of his projected multivolume edition was coauthored by Davies’ student Stephen Wheatcroft and published by Palgrave Macmillan in 2004 under the title The Years of Hunger: Soviet Agriculture, 1931-33.